The Knight Club is a parent based club to help generate funds for our high school football players. All funds are directed towards the player athletes. We participate in many different fundraising activities, such as: Texas hold-em tournaments, raffles, bus trips, parking passes. We are always interested in new fundraising ideas. The Knight Club in the past has helped supplement the team camp meals, provided team apparel, provided pre or post-game meals, the stadium flag pole, sideline carpet, and helped with some uniform additions. 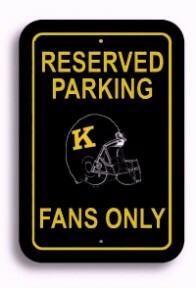 We started the Knight Club pre-game parking tailgate in 2008 and will continue with this great new tradition. This is a great way for parents and families to get to know each other and has been growing every year. All families and alumni of Kenowa Hills are welcome! Come join us as we get ready to cheer our Knights to victory! The Knight Club offers a parking pass as one of its fundraisers each year. These passes will be available for the fall season this summer.